Have you tried updating that old version of CPU-Z, or even removing it, then run Speccy again? It appears Speccy leverages the CPU-Z driver to gather CPU information (CPUID v1.0.3.8) and it extracts it in %TEMP%\cpuz138 folder and probably calling it through %TEMP%\speccycpuid.dll (CPUDI SDK DLL, v1.1.1.6). The problem doesn't happen all the time, but it is annoying if you happen to start Speccy when you have things unfinished / unsaved. I have the same issue - which in my case happens repeatedly, every time I try and run Speccy. I'm Windows 10 x64 and have (had) Speccy version 1.28.709 - I've had to remove the program from my computer until such time as the issue gets resolved - which I hope will be sooner rather than later? I'm yet another user experiencing the same issues with Specky (1.28). (W10 Pro x64 RTM) I have not seen a blue screen in years, so this whas a bit of a surprise. So it certainly makes me wonder what M$ did to the OS to potentially cause the problem. I had to uninstall Speccy to stop the BSODs in a clean install of Win 10 Pro x64 (PAGE_FAULT_IN_NONPAGED_AREA). I was getting them frequently after installing the latest version of Speccy, but I didn't know that was the cause at the time since I installed a lot of my other utilities in the same session. (Will not do that again.) I had to install WinDbg to try and decypher the minidump files, which then pointed to Speccy and its use of an outdated CPU-Z driver as the culprit. Reinstaliing and Uninstalling the latest CPU-Z (v1.73) didn't solve the BSODs since Speccy was still using an older verision internally or something silly like that. Only uninstalling Speccy fixed the issue. As to why it is taking more than one day for Piriform to update its internal version of CPU-Z to the latest (which doesn't BSOD Win10) is completely beyond me. Just wondering is it fixed by now? Since a member of the Admin staff has stated it has been passed on to development, my guess is you will know when it appears in the Change Log in a future release. Oh, didn't know there is change log, but now I searched for it and I found out that it's not fixed yet. No changelog mentions it because no new version has been released since the report was made. I just ran Speccy 1.27 (with no problems) for the first time in several months then realized it had been awhile since I checked for an update. I saw an update was there so I downloaded and installed 1.28. 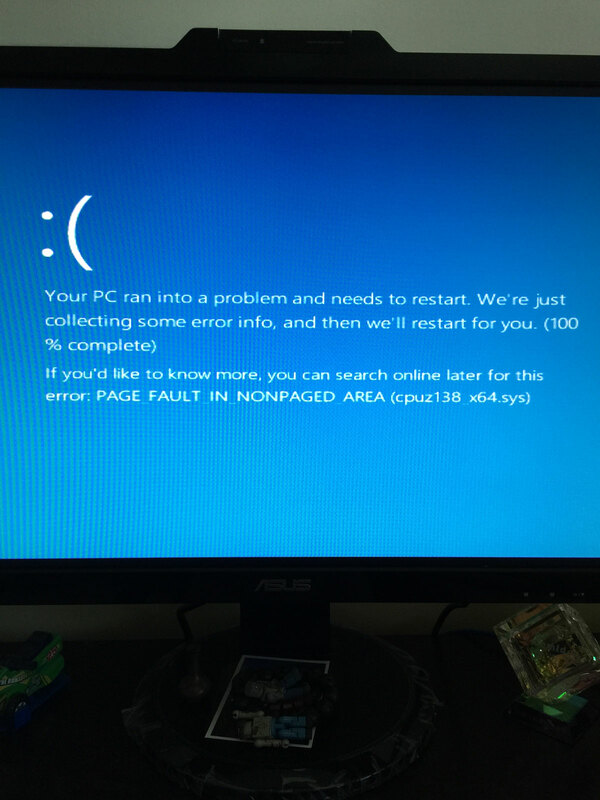 When I ran it I almost immediately got my first BSOD ever with Windows 10 Pro 64-bit. It also reported the same error with CPU-Z as others here have noted. A quick Google search led me to this thread where I decided to add my "ditto". I am glad to see that Piriform is aware of the problem and, based on past experience with Piriform, I am sure an update with the fix will be released soon. makes me wonder what M$ did to the OS to potentially cause the problem. Wow. So running only the latest version of "Speccy" causes a BSOD with "CPU-Z" - two programs that are NOT made by Microsoft, no other BSODs in "years" indicating all other programs run just fine, yet Microsoft is to blame for creating this problem? ??? FTR, I did not have any BSODs with 1.27. Only after upgrading to and running Speccy 1.28 did I receive BSODs with W10 - my only BSODs with W10. Running V1.27, HWMonitor, HWInfo64, CoreTemp, Belarc Advisor, Windows System Information and CPUz - not to mention all my other programs too - do not and have not caused any BSODs. I'm all for bashing Microsoft when bashing is due - and certainly they've done plenty that deserves bashing. But when running only the latest version of one (non-Microsoft) program out of dozens (100s? 1000s?) in "years" causes such a specific BSOD, you cannot blame Microsoft. Even IF this problem surfaced only after installing a recent Windows Update for W10, the fact only Speccy reports this specific problem strongly suggests that only the latest version of Speccy is making a call (setting a hook or whatever the programming term is) it shouldn't. Especially since similar hardware monitoring/system information programs (including CPU-Z) (programs that generally get their data from the same sensors and data sources) work fine. needed to run Speccy today to get some info for someone, and yep, BSoD on Win10. downloaded the Portable version, deleted speccy64.exe, double clicked speccy.exe and it worked fine. but the same theory should work on the non-portable version, just get rid of the 64bit version of Speccy so it doesn't try to use it on a 64bit PC and it'll just use the 32bit one which the CPUZ sys file still works with. Good info mta which could help people with this problem. 27/9/2015 Using windows 10 build 10547, got the same problem, but it is intermittent. Will try sticking with the 32 bit version. I'm having this to. And I have not installed cpuz. Is it a component used by speccy? yep, it seems CPU-Z is called from within Speccy. What's difference between both exe? 32 bit version still can gather true info at a 64 bits system? 64bit software can utilise 64bit architecture, but 32bit software can still run on 64bit hardware. I'll join in - Dell XPS13 running Windows 10. Speccy is unusable, causes the same issues as already described. Any news on an update for Win 10 64 bit?